Note: Human contact with sewage is a serious public health risk. Many waterborne diseases exist in household sewage. ! AVOID CONTACT! • Back up of multiple fixtures at home at the same time. 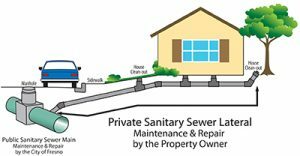 • Water is visible, flowing or overflowing on the exterior sewer vent. • A sewer vent or clean-out is often found on the exterior of a home, with a visible cap. • Years of built-up, grease and grime. • Foreign objects flushed down the toilets. • Tree roots invading broken pipes. • Broken or dislocated pipes.